STAR WARS: THE EMPIRE STRIKES BACK, 1980. Super Rare Original Style B “purple variant” 1 Sheet (27″ x 41″) movie theater poster. This purple variant version is extremely sought after and very rare. There is a subtle variation in the overall toning of the purple variant that makes it have a lavender color. Look closely at Luke’s head, there you can see his hair is darker in the purple variant and with stars clearly showing through. The sky blue version shows Luke’s blonde hair. What is more easy to discern is that this version also lacks the NSS information which commonly happened for posters printed for use in the studio. In addition, the title of the poster is on the bottom left margin, and it say “one sheet style B” on the bottom right, which is not in the standard sky blue version. 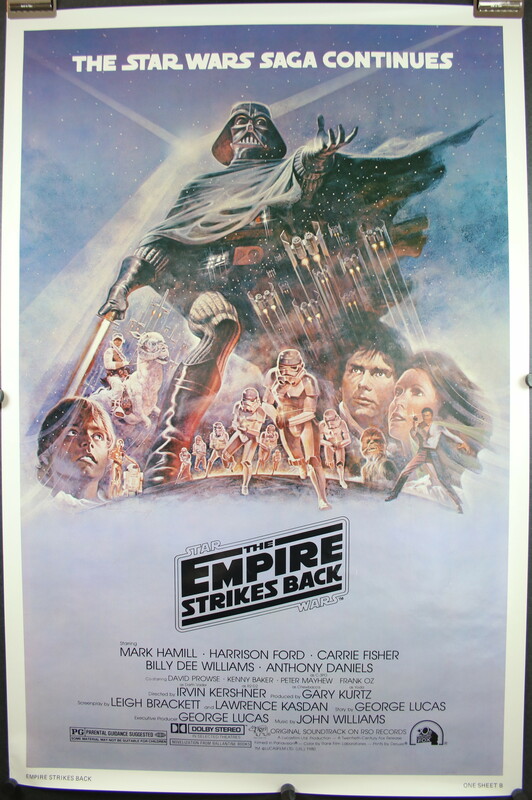 Emovieposter has sited confirmation from Steve Sansweet and Peter Vilmur of the “Star Wars Poster Book” stating the poster was printed for internal use only by 20th Century-Fox and Lucasfilm. They were never distributed to theaters. They further stated that there are fewer of these purple variants than the NSS versions. This Empire Strikes Back purple variant is in investment grade condition. I obtained this copy directly from the former propmaster for Lucasfilm. Frank Cho’s Jungle Girl v2 #2 – Page 2 – Original Art by Adriano Batista!